I'm seriously mourning the fact that my roommates and I polished off this best ever eggplant parmesan a couple weeks ago. Unfortunately, (or fortunately, depending on how you look at it) most of the photos in this post are melted cheese. I was really nervous about my ability to take food photos while living in D.C. this summer. Food photos are sort of a finicky business. You have to have a good-sized window, and it has to face a certain direction in order to get the best light, which only occurs at certain times of the day. I'm learning, but I still haven't quite mastered the lighting situation yet. Or the food photography situation, to be honest. But, once I moved into my D.C. apartment, I was delighted to discover that I have a window in my room that is perfect for food photography. The only problem is that my room is on the third floor and the kitchen is on the second. Running up and down the stairs with ingredients and different stages of a recipe for a photo would just result in too much stress and/or marinara sauce all over our white carpets. So, you have photo after photo of melted cheese. 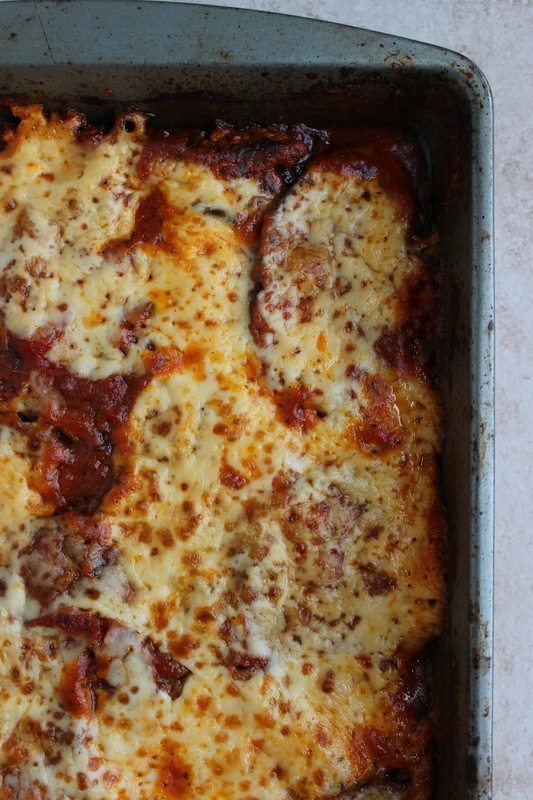 There is eggplant under that cheese, though, I promise. Delicious, disintegrating, melt-in-your-mouth eggplant. This recipe comes from my sweet friend Erin, who has guest posted here several times before (First with this gluten-free pumpkin pie, then this delicious crock pot cranberry sauce) I was feeling a bit uninspired, food-wise, at the beginning of the summer, and she graciously sent me the recipe for her mom's famous eggplant parmesan. I am not exactly sure if I love this recipe so much because it is ooey gooey and filled with cheese and sauce, or if I love it because it reminds me of special occasions. In my family my mother’s Eggplant Parmesan is famous and almost everyone requests it as their special meal for their birthday, graduation, confirmation…really everything! This is comical because Eggplant Parmesan is an Italian dish and we are about as Irish as it gets. I hope you try this very simple, yet incredibly delicious, dish and make it a special meal for your family as well. Dip a slice of eggplant in egg allowing excess to drip, then in breadcrumbs and then in a prepared skillet with olive oil. Repeat for all slices. Warning: your fingers will get messy so have a friend nearby with a towel. Allow eggplant pieces to cook (flip after a few minutes) until browned on both sides. 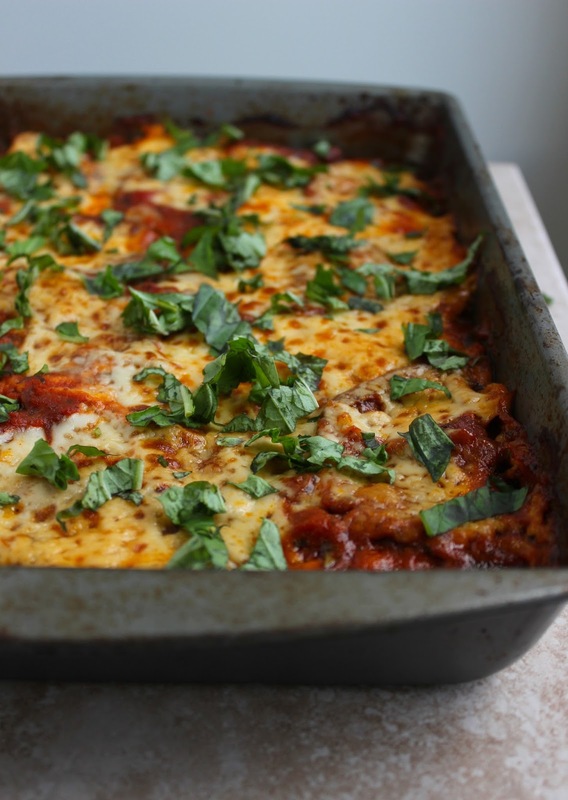 Arrange slices in a single layer in your glass pan on top of the sauce. 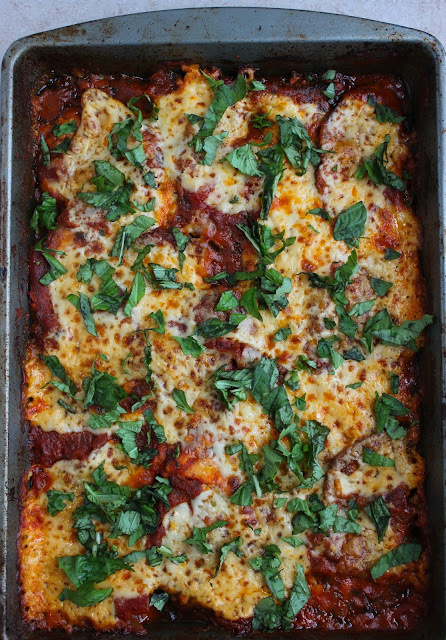 Top the eggplant with an even layer of 1 cup of the mozzarella, then an even layer of 1 cup of the Parmesan. Repeat for a second layer. 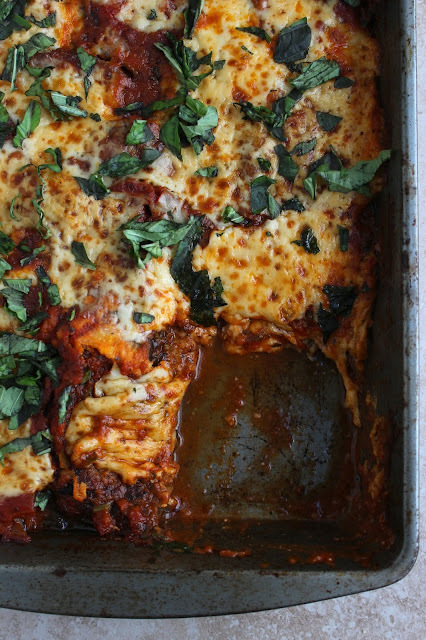 Sprinkle with basil and enjoy with a salad, glass of wine, and a few friends or family members! *if you do not want to buy prepared breadcrumbs, I recommend toasting up a loaf of your everyday sandwich bread and throwing it in the food processor. Then add some of your favorite seasonings like salt, pepper, garlic powder and parsley. Well I like the shots of all the cheese! :) And no, running up and down for different stage shots does not sound like a good idea!! haha I'd make a huge mess! This eggplant looks fantastic! I love me some melted cheese, so no complaints here! 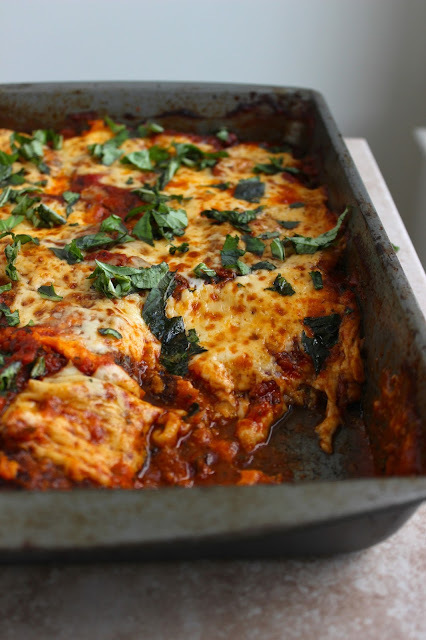 :-) Eggplant Parm is a delicious dish and yours looks really tasty. I'm looking forward to getting some fresh ones from my in-law's garden soon. I made this today. It was great. First time ever I have attempted eggplant parm. I used gluten free bread...it didn't stick well but i will toast it net time. All in all, this was good. I will make it again. Thanks!